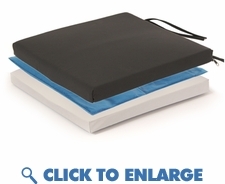 This pressure relief gel cushion is designed for the prevention and healing of bed sores and pressure ulcers. The low profile gel bladder is divided into two sections and is strategically placed into a high density medical grade foam. This design offers superior pressure redistribution over a wider surface area to eliminate pressure sores and ulcers. The breathable cover is removable and washable. It has 2 security ties for added safety. Helps in prevention and treatment of pressure sores. (2) security ties for added safety.